PEARL, MS -- The Southern League of Professional Baseball Clubs announced its South Division All-Star team Wednesday, June 7, selecting seven Mississippi Braves players to the 2017 Southern League All-Star Game. The North Division takes on the South Division Tuesday, June 20 at Blue Wahoos Stadium in Pensacola, FL. Two pitchers and five position players were selected to represent the Mississippi Braves as Southern League All-Stars. LHP Kolby Allard and RHP Mike Soroka , both just 19-years-old, were both named to the South Division roster. Position players include outfielder Ronald Acuna , infielder Travis Demeritte , infielder Joey Meneses , catcher Kade Scivicque and infielder Luis Valenzuela . Allard, 19, is 4-3 with a 2.87 ERA in 12 starts for the M-Braves this season. The southpaw was named Braves Organizational Pitcher of the Month at Double-A Mississippi after going 1-1 with a 1.67 ERA in five starts during the month of April. As ranked by Baseball America, the Braves No. 3 prospect currently ranks 10th among Southern League Leaders in ERA. Allard went 8-3 with a 2.98 ERA in 16 starts between R-Danville and Low-A Rome last year. A native of San Clemente, CA, Allard was selected by the Braves in the first round of the 2015 draft. Soroka, 19, is 7-3 with a 2.73 ERA in 11 starts for the M-Braves this season. The Braves No. 4 prospect, as ranked by Baseball America, turned in his best performance of the season earlier this week. The young hurler held Biloxi to just three hit while striking out nine in eight frames. Soroka is tied for the league lead in wins and ranks ninth in ERA. He went 9-9 in 25 games for the Rome club last season, posting a 3.02 ERA. The Canadian was selected by the Braves in the first round (28th overall) of the 2015 draft. Acuna, 19, is hitting .365 with 12 extra-base hits, 18 RBI and 13 stolen bases (fourth-best in the league) in 27 games since joining the M-Braves on May 9. He was named Braves Organizational Player of the Month at Double-A Mississippi after posting a .415 batting average with seven doubles, a triple, three homers and 15 RBI in 21 games during the month of May. The young prospect was hitting .287 with three doubles, five triples, three homers, 19 RBI and 14 stolen bases in 28 games at High-A Florida before his promotion. As ranked by Baseball America, the Braves No. 6 prospect spent most of last season at Low-A Rome, hitting .311 in 40 games. A native of Venezuela, Acuna was signed by the Braves as a non-drafted free agent on July 2, 2014. Demeritte, 22, has a .260 batting average with 13 doubles, two triples, 10 home runs and 31 RBI in 55 games with the Double-A Braves this season. His 10 blasts rank tied for fourth-most in the Southern League. He also leads the league in extra-base hits (25) and runs scored (39). The Braves No. 19 prospect, as ranked by Baseball America, combined to hit 28 home runs and drive in 70 runs last year between High-A High Desert and High-A Carolina. The New York native was acquired by the Braves from the Texas Rangers on July 27, 2016. He was originally selected by Texas in the first round of the 2013 draft. Meneses, 25, is hitting .306 with five doubles, six home runs and 24 RBI in 51 games with the Double-A Braves this season. He currently ranks sixth among Southern League Leaders in batting average. Meneses is hitting .325 against southpaws. He split the 2016 season between High-A Carolina and Double-A Mississippi where he hit .342 and .234, respectively. A native of Mexico, Meneses was signed by the Braves as a non-drafted free agent on May 9, 2011. Scivicque, 24, is hitting .284 with six doubles, two home runs and 13 RBI through 39 games with the M-Braves this season. The catcher posted .314 and .300 batting averages in the months of April and May, respectively. A native of Baton Rouge, LA, Scivicque was acquired by the Braves from Detroit along with Mike Aviles on August 16, 2016, in exchange for Erick Aybar. He was hitting .282 through 106 games at High-A Lakeland at the time of the trade last season. Scivicque was originally selected by Detroit in the fourth round of the 105 draft out of LSU. Valenzuela, 23, has a .278 batting average with 12 doubles, three triples, one homer and 15 RBI in 43 games with the Double-A Braves this season. He's hitting .361 against southpaws compared to .256 against right-handed hurlers. Valenzuela missed a large portion of last season with a right-hand fracture to start the season but joined the High-A Carolina club on July 7 where he posted a .270 average in 44 games to finish the season. A native of the Dominican Republic, Valenzuela was acquired by the Braves from Kansas City on August 31, 2015, in exchange for Jonny Gomes and cash. The North Division All-Stars were announced Tuesday, June 6. Players were selected after a vote by Southern League field managers, radio broadcasters, general managers and print media. All players on Southern League rosters as of May 31 were eligible in the voting. Starting lineups for the North and South Divisions will be announced on Thursday, June 8 and Friday, June 9, respectively. 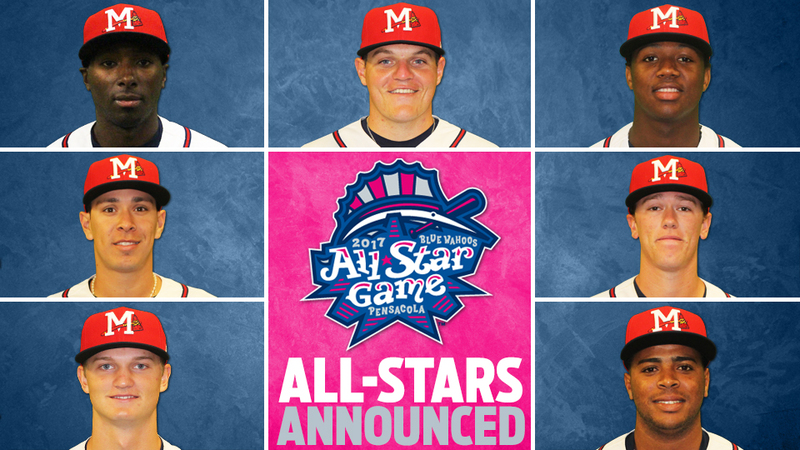 Don't miss your chance to see these all-stars and the rest of the 2017 Mississippi Braves. The M-Braves enter tonight's game against Biloxi 4.5 games out of first place in the Southern League South Division. The Braves travel to Pensacola June 9-13 before returning home for a five-game series against the Biscuits to wrap up the first half. Catch your favorite all-stars in action at the 2017 Southern League All Star Game on Tuesday, June 20 in Pensacola. For more information on events and festivities, visit bluewahoos.com.